Every so often, I come across a horror film that leaves me staring at the screen with my mouth hanging open and wondering what the hell I just watched...but in a good way. It doesn't happen often. Those that leave me wondering what the hell I just watched in a bad way seem to be far more common. I'd put Irreversible (2002) in this second group. It not only made me wonder what the hell I had just watched, but it left me asking why I would subject myself to something like it in the first place. Until now, my go-to example of the first group of films would probably have been Antichrist (2009); however, it has never been a great example because I can't claim to have enjoyed it all that much. I appreciated its art, but it was a bit too strange for me to enjoy, more like a bad trip than a film. Now that I've seen Darren Aronofsky's mother! (2017), I believe it is a better example of the first group of films. It blew me away, was more than strange enough to make me feel like I was watching something different, and I can say I enjoyed it. So yes, it delivered the WTF reaction but in a good way. As I try to do whenever possible, I went into mother! completely cold. I had not read a single review or heard anything about the film from anyone I knew. I was aware that it starred Jennifer Lawrence, but since I didn't know who Jennifer Lawrence was, I don't think that influenced me a whole lot. I was pleasantly surprised to discover that it also starred Javier Bardem. He's far from my favorite actor, but I thought he was perfect for this. Even better, Ed Harris and Michelle Pfeiffer appeared too (I'll have more to say about her below). Despite not knowing who Jennifer Lawrence was, I thought she did a pretty good job. That's a good thing because the camera was on her the entire time. I think it would be fair to say that the success of the film came down to her ability to convey her emotional reactions in the moment. She was impressive. It wasn't until a few scenes toward the end of the film that I found myself wondering how a better actress would have handled the role. I would expect opinions on mother! to be mixed. Fans of modern mainstream horror flicks aimed at teenagers probably won't like it. If you hated The Witch because you thought it was boring, I'd have a hard time recommending this one to you. It was about as far from boring as anything I can imagine, but there were some similarities in terms of pace and tone. This is psychological horror at its finest; however, there is also a point in the film where things become surreal in ways one doesn't typically see outside of art films. While it didn't abandon structure like Antichrist, it became weird enough that it will turn many people off. There was a sense that the director was playing with the audience, which is something I usually like. I liked it here too. It reminded me of The Shining or in the limited sense that it is one of those films that made me wonder whether what I was seeing was supposed to be happening or whether I was witnessing a descent into madness, a dream sequence, lots of symbolism, or something else. Good psychological horror should be thought-provoking, and this one delivered. In terms of subject matter and some of the way the film used tension and dread, it had a strong Rosemary's Baby vibe to it. By the end, it was more like watching Rosemary's Baby after taking hallucinogens. 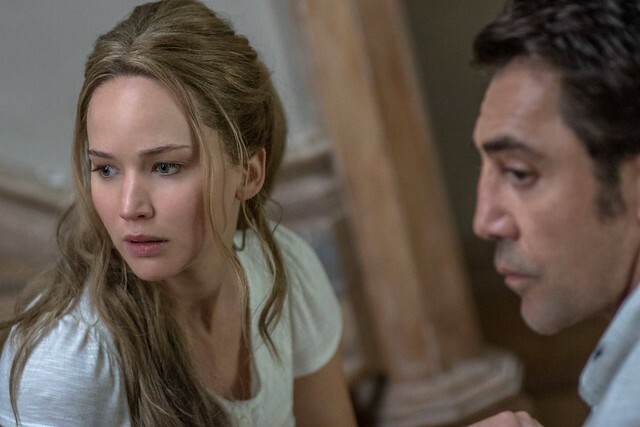 There is not much point in attempting to summarize the plot of a film like mother!. The best I can do would be to say that it involves a writer (Bardem) and his young wife (Lawrence) living in a massive old house out in the middle of nowhere. He's struggling to find inspiration and overcome writer's block, and she's restoring their home. There's a knock on the door, and things slowly move from odd to downright bizarre. This journey is what I enjoyed so much about the film. At first, things are just mildly off-kilter. A character says or does something that seems a little strange. You see something that looks out of place. This progresses to the point where it is clear that something is wrong but still not clear what it is. And as the tension keeps ramping up, we move from unsettled to really uncomfortable. And that's when reality itself starts to disintegrate. Although I did not find mother! to be scary in a traditional horror sense, this did not bother me because of how effectively tense and unsettling it was. It seemed like just when I thought I had something figured out, there would be an unexpected curveball. I'd sink back into my chair realizing I was wrong and not feeling much closer to figuring anything out. The psychological torment inflicted on Lawrence's character (and the audience) was astounding. Although this is far from a perfect comparison, I found myself thinking that watching mother! for the first time reminded me of the experience of watching Rosemary's Baby for the first time. The difference was that mother! was much more unsettling, off-kilter, and provocative. There was a nice surprise in terms of acting that deserves comment. Jennifer Lawrence was undeniably the star, but Michelle Pfeiffer was amazing here. It had been a long time since I'd seen her in anything, and I'd nearly forgotten about her. Her part was not a big one, but she stole every scene she was in. After her performance in mother! the job offers should be rolling in. Somebody needs to write parts for her again. I probably won't be rushing out to buy a copy of mother! for my horror collection, but I could easily imagine wanting to pick it up at some point. While watching it, I found myself thinking that I was going to need to see it at least 2 more times to fully appreciate it. In this age of largely forgettable throw-away films, I think that it high praise. I enjoyed the ride and found myself thinking about it the next day. I can't ask much more from a horror film.